It was 1842 and James Skinner, his wife Jessie and his oldest son, James Jr., stepped off a boat into the United States. Thirty years old at the time, Skinner had been born in the Scottish town of Kettle in the county of Fife. His education had been interrupted when he was 11, so that he could help his family and he worked with his father in the weaving and carpentry trades. Reduced to a part-time, night school education, he finally became an engineer and worked as such in Glasgow for six years before leaving Scotland. For 10 years after arriving in America, Skinner worked for a silk cloth manufacturing company in Massachusetts. In 1852 he took his family and headed west to California, where he mined at Foster’s Bar, near Coloma. Apparently he was quite adept in his mining skills, because in just four years he had enough money to acquire a large claim on land in Green Valley, also known as White Oak Township, just north of today’s Cameron Park. After building a home for his family on the property, in 1861 he set about planting a vineyard, one that soon became the largest in the county. 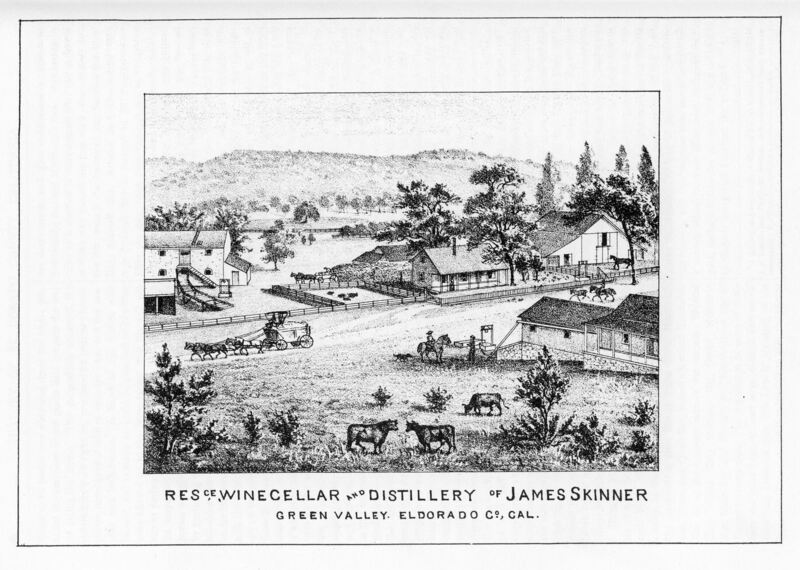 James Skinner was not in the business of raising market grapes, it was his intent to use the grapes to make wine, brandy and vinegar and he had a perfect location to build his winery and distillery — adjacent to today’s Green Valley Road. At that time what is now known as Green Valley Road was appropriately called the Folsom-Coloma Road and one of the busiest routes in the county with numerous inns and stage stops where a hungry miner or teamster could find food and a place for the night. The first miners — those who arrived by ship or foot from Oregon and from towns along the coast of California — blazed this route to get to Mormon Bar, New York Creek, and ultimately, Coloma, only a few months after James Marshall picked up those first few flakes of gold at Coloma in January of 1848. Because nearly all the traffic heading from Sacramento to Coloma and the mines to the north passed by the Skinner property at the corner of what is now Green Valley Road and Cameron Park Drive/Starbuck Road was one of the reasons he selected that parcel. It was an ideal location because just a short distance to the east was a large brick store and the Wing House, a favorite of the big freighting outfits, and to the west, Frederick Engesser’s Green Valley House. On the north side of Green Valley Road he erected a large, two-story winery 50 by 28 feet in size with a wine cellar capable of storing 15,000 gallons. To the south of it, across the road, he erected his distillery which was connected with the winery and wine cellar by pipelines that passed under the road. Both of these buildings, and some accessory buildings, were constructed of local rock and brick, making them for all purposes, fireproof. The business was successful and continued for many years. It was later operated by one of his six sons, George, after the death and burial in the family plot of James in 1885 and Jessie in 1898. Sometime before the enactment of Prohibition, the business was abandoned, but portions of the buildings on the north side of the road would later become a nursery. Mike Skinner then contacted the El Dorado County Museum and the El Dorado County Historical Cemetery Commission. “They sent me two family trees,” continued Mike. “The first one was a family in Placerville and I didn’t recognize any of the names. When I looked at the second one, there was my grandfather’s name and the name of his brothers. I started asking around and found more and more information on the family and especially my great-great-great grandfather and his winery in the Rescue area. “We flew to El Dorado County to look around and maybe buy five acres of land in the Rescue area and plant some grapes like James did,” Mike said. The area appealed to this generation of Skinners. “We ended up buying 25 acres and a house,” added his wife Carey with a smile. That first land purchased was part of the Wing ranch on the south side of Green Valley Road, and on it they planted grapes, calling it the White Oak Flat Vineyards. The following year they purchased 67 acres of land near Stoney Creek that had once been part of the 7-Up Ranch in the Fair Play area. It had some grapes planted on it, but the family soon added more and started building the state-of-the-art winery and tasting room on the land they call Stoney Creek Vineyard. The grape varieties planted on the two properties include 10 Rhone varietals, along with some legacy varietals planted by James Skinner. The Fair Play tasting room and winery is a fantastic facility, both in beauty and utility. The tasting room was designed using drawings of James Skinner’s buildings in Rescue. The striking structure blends well into the countryside and consists of two stories, with the tasting bar and a large deck on the upper story and an even larger patio area below. The view from both levels is generally to the east and includes the Skinner vineyards, other vineyards and snow-covered mountains, including Pyramid Peak in the far distance. Inside, on the lower level, is a large, intimate dining area and a glass fronted wine cellar. The whole building is designed and equipped to use for dinners, parties and events. Winemaker Chris Pittenger helped design the winery based on his knowledge of and experience in the winemaking process. “I obtained a degree in agricultural business from Cal State San Luis Obispo. After graduating, I worked in restaurants, picking up wine knowledge until I became a sommelier. I loved wine and always wanted to be part of the wine industry and make it,” said Pittenger. The building has maximum insulation and even the roll-up doors in the east end have windows to let in natural, morning light, which requires minimal artificial lighting inside. The barrel rooms are on the cooler, north side of the building and each of them has a roll-up door separating them from the large, winemaking area. Offices are on the warmer, western end. The only air conditioning is in the four barrel rooms, in which the temperature can be individually controlled, according to the wants of the winemaker. The winemaking area is all gently sloped towards the floor drains and the equipment has been designed to make cleaning fast and easy. One of the cellar hands, Eric Wolff, who is also the assistant tasting room manager agreed that what had been done was good, especially for him. “The winery is designed with a capacity of 10,000 cases,” continued Pittenger. “Right now we make around 2,000. Since 2007 we had been making our wine elsewhere, but our first crush here was in 2010 and it was pretty exciting, since the grapes and equipment arrived at the same time the water system was completed and the electricity turned on. Skinner Vineyards and Winery tasting room is located at 8054 Fairplay Road in Fair Play and can be reached at 530-620-2220. The present tasting room hours are Friday through Sunday, from 11 a.m. until 5 p.m.